February 2016: Protesters, under the aegis of Sozandagoni Vatan, gather outside the Turkish Embassy. Source: Asia-Plus. We repost this article with permission from Fergana News. Civic activism has been on the rise in Tajikistan in recent years. At first, groups of disgruntled women started breaking into opposition parties’ offices and western embassies, accusing the first of wanting to start a new war in the country, and the second of harbouring dissidents. Then the disgruntled women vanished, only to be replaced by student activists from pro-government youth organisations. At a time when any anti-government protest — not just a rally, a picket, demonstration or even some small gathering outside a government building — is broken up by the police in Tajikistan, members of these organisations are free to hold rallies and demos, block the streets and even cause mass unrest. They are very demanding, these young people. “We demand!” they shout. The only thing is: they don’t demand anything from their own authorities, just foreign governments and Tajikistan’s opposition. Sozandagoni Vatan (“Homeland builders”), founded in 2011, is the youth wing of the ruling People’s Democratic Party (PDP) led by president Emomali Rahmon. In 2015, the organisation found itself at the centre of a scandal connected to the resignation of its then-leader Isfandiyor Abdurakhmonov. Leaving his post, Abdurakhmonov issued a statement accusing his fellow members of parochialism, falsifying records, embezzlement and other improper activities. “I hope to god that the president has thought about this and sent the Tax Commission and Anticorruption Office to check on your accounts,” he warned his ex-associates. It is unclear whether the PDP’s leadership acted on Abdurakhmonov’s advice. Not that it would make any difference, given Sozandagoni Vatan’s key role in maintaining young Tajiks’ loyalty to the government and creating “correct” public views of “friends” and “enemies”, “patriots” and “traitors”. The “Homeland builders” not only organise rallies and flash mobs in support of Rahmon and his government’s policies, they also run protest demos outside foreign embassies, demanding the extradition of opposition figures who have fled to other countries to avoid persecution at home. Sozandagoni Vatan organised, for example, rallies outside the Turkish Embassy and the EU Diplomatic Mission in Dushanbe, as well as the Organisation for Security and Cooperation in Europe (OSCE) offices in Khudjand, Tajikistan’s second city, demanding the extradition of what they called “traitors to their country” — in other words, supporters of the banned Islamic Renaissance Party of Tajikistan and Group 24. 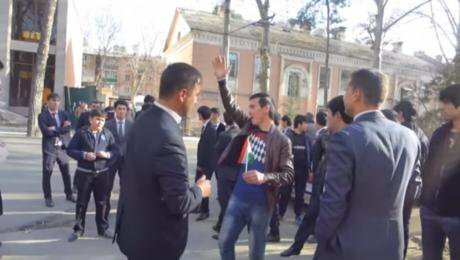 Tajikistan’s other pro-government youth organisation Avangard (“Avantgarde”) gets up to similar protest stunts, in clear cahoots with Sozandagoni Vatan. Avangard was founded in 2015 on the initiative (and the assistance) of the Tajik police authorities, and sees its mission as preventing young people from getting involved in terrorist and extremist organisations. From the information posted about it on the official Ministry of Home Affairs website, it is clear that this preventive work, which is also aimed at Tajik migrant workers in Russia, is carried out at public expense. It is equally clear that it receives money from government sources to put on its “public” protest activities. These events are, only too obviously, badly scripted and directed pieces of street theatre. Take, for example, the latest demonstration, which took place towards the end of September and was timed to coincide with the OSCE Human Dimension Implementation Meeting taking place in Warsaw, and which was attended by several Tajik opposition figures. Avangard activists held meetings in various universities (which allowed them to use lecture theatres in class time), organised a rally outside the OBCE office in Dushanbe and made a nuisance of themselves outside the homes of exiled opposition activists, throwing eggs and burning photographs of them. They were assisted in this enterprise by being ferried around in city buses. People in Tajikistan, young people especially, are used to blindly following orders from above — the failure to obey can have unpleasant consequences. Being part of a crowd, chanting slogans, lynching family members of so-called “enemies of the people”, including small children (in the town of Kulob, a crowd of “patriots” beat up the nine-year-old daughter of opposition activist Shabnam Khudoydodova) is, on the other hand, perfectly safe. Tajikistan’s rulers are certainly not the first to use their administrative resources to fight their opponents. Many post-Soviet governments use tame “voluntary organisations” and “local activists” as mouthpieces for “public protests” and to discredit dissidents. Yesterday, it was “mouthy women”. Today, it’s “shrieking students”. Tomorrow, perhaps “angry teachers” or “insulted farmers”. Neighbouring Kyrgyzstan has had the concept of OBON (the acronym stands for “special purposes women’s squads”) for over ten years. Their members are usually marginalised women whose job is to behave aggressively — start loud rows on street corners, block roads, drag people by their hair, use verbal and physical abuse, intimidate and throw people out of officials’ offices, as well as blackmail and the blackening of their opponents’ names. Judging by the fact that OBON’s victims are those who express views unfavourable to the government, the acts of aggression must be ordered by the government itself. The Tajik government had adopted a policy of intimidation, blackmail as well as physical and psychological terror towards their political opponents. In Kyrgyzstan, the authorities frequently mobilise the “voice of the people”, using not only OBON but other citizens willing to make public statements in support of the administration. One recent example is a demand by “a group of residents of the town of Osh” to strip two human rights campaigners, Aziza Abdirasulova and Tolekan Ismailova, of their citizenship. This happened soon after Kyrgyz parliamentarians ganged up on the two women, accusing them of treason because “they smile and laugh and agree with the views of Kadyrjan Batyrov” — a political émigré sentenced in absentia to life imprisonment by a Kyrgyz court. The actions of OBON often flout Kyrgyz law, but there is no hard evidence that anyone who has taken part in them has ever been punished. According to information held by Human Rights Watch, the groups of “protesters” often include members of the local security forces in plain clothes. And when their victims phone the police, they rarely respond and when they do come out to the crime scene, they just stand around, doing nothing. The Tajik government had adopted a policy of intimidation, blackmail as well as physical and psychological terror towards their political opponents. As Mukhiddin Kabiri, head of the banned Islamic Renaissance Party, says, the government may label them radicals and extremists, but it uses extremist methods itself.